McMan, Ann. 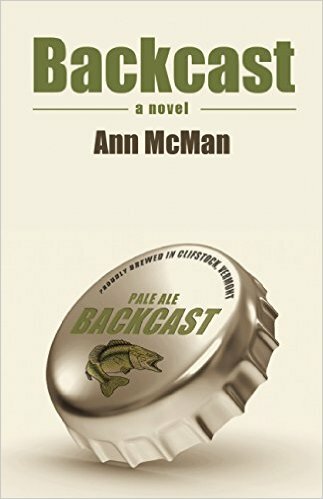 “Backcast”, Bywater Books, 2015. Barb Davis, an author and sculptor has been awarded a grant by the National Education Association to pair feminist sculptures to first person essays about transition in women’s lives. She thinks of various ways as to how to accomplish this and comes upon the idea of holding a writer’s retreat at which twelve of the best and most notorious (McMan’s word, not mine) lesbian authors writing then. Once the women come together, they enjoy happy hours and writing sessions as well as a tournament bass fishing competition. McMan descriptions and details are delicious and I felt that I was actually with the women in Vermont on Lake Champlain. We meet a fascinating cast of characters and I am speaking just about the women at the retreat. The local color adds a great deal to the writers who experience everything from writer’s block to unexpected and unpredicted attractions. This is serious business for Barb—she knows she has to produce what the grant is intended for but there is time for dalliances, romance and just fun. She simply must not lose sight of her original intention and with twelve writers hovering around her, that could be quite easy to do. The women know that they are there for the purpose of helping Barb with her grant but as we can well imagine there is a lot of play going on. There is also the character of Phoebe, a fish and life-coach who helps the women find a world of secrets that are diverse. Do not ask me to explain the fish—read the book and find out for yourselves but I do admit that a fish named Phoebe is a very strange character. There is also the legend that Phoebe has been swimming there since the Civil War and has never been caught—does that not make us wonder if Phoebe knows something that we don’t? One of the amazing aspects of the book is the way comedy and pathos work side by side and how wonderfully author McMan writes about them. If I had to classify this book, I would say that it is a look at empowerment and self-discovery. The twelve women and Barb constitute, for me, at least, a microcosm of American lesbian life and as we hear about them, we learn about all women and the way they live, how they love and their joys and woes. I felt drawn into the lives of the characters and as a male reading lesbian fiction, I can you that this rarely happens to me. I am sure that this is because of the gorgeous prose of the story and the fact that I can almost see the author planning out her novel. From the very first sentence, “Mornings were the best times”, I was drawn into the story and it is very hard to write about it without giving something away and so I will stop here and just use a quote on a blurb on the back of the book, “’Backcast’ is ‘Fried Green Tomatoes’ meets ‘The Big Chill’ by way of ‘A River Runs Through It’”. This entry was posted in GLBT Film on September 6, 2015 by Amos.